The BMW Z1 was a two-seat roadster automobile developed by BMW. It was produced from March 1989 to June 1991. The Z1 featured doors which dropped down into the door sills. A total of 8,000 cars were produced. All the Z1s were left-hand drive, except the final one built. The last Z1 was hand built. It was the only 2.7L version of this car. The first example of the Z1 was released by BMW to the press in 1986 and later officially presented at the 1987 Frankfurt Motor Show. Initial demand was so fierce that BMW had 5,000 orders before production began. However, demand dropped significantly around 1988 and BMW ended production in 1991. There is speculation that the drop in demand was due to the early inflated demand from speculative investors. In 1988, however, BMW was quoted as saying that they had 35,000 orders for the Z1. 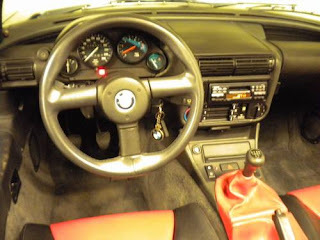 The BMW Z1 was designed over a three-year period by an in-house division of BMW Forschung und Technik GmbH. The development of the Z1 is attributed to Dr. Ulrich Bez, not to forget the core of his team at BMW Technik GmbH (Harm Lagaay, Alexander Pregl, Rudolf Müller, Lutz Janssen, Wolf-Henryk Menke, Dieter Schaffner, Klaus Faust, Sabine Zemelka, Patrick Ayoub and Stephan Stark). Control of the project was turned over to Dr. Klaus Faust when Bez left for Porsche in October, 1988. 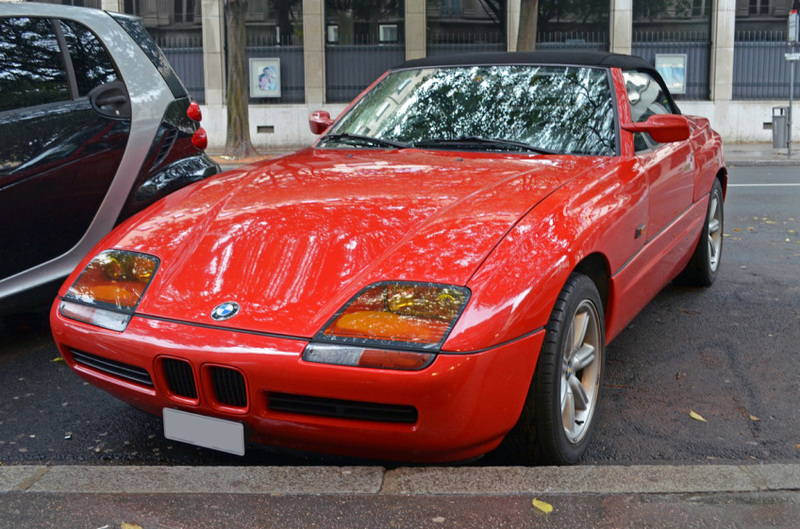 The BMW Z1 was used to develop and debut several technologies. Z1 designer Harm Lagaay mentioned that Z1 production helped generate patents for BMW's high-intensity discharge lamp, integrated roll-bar, door mechanism, and underbody tray. The Z in Z1 originally stood for Zukunft (German for future) and would later be used on other cars in the line: the Z3, Z4, and Z8). All of these vehicles (including the Z1) are two-door roadsters (except for the few M coupe and Z3 and Z4 hardtop models). The chassis was specially designed for the Z1 and features a number of innovative features: removable body panels, continuously zinc welded seams, a composite undertray, and the unusual dropped doors. Parts of the car (including the engine, gearbox, and front suspension) were borrowed from theBMW E30 325i and 325Ix, but the Z1 remains largely original. The body was made from plastic and could be removed completely from the chassis. The side panels and doors are made of General Electric's XENOY thermoplastic. The hood, trunk, and roof cover are GRP components made by Seger + Hoffman AG. The car is painted in a special flexible lacquer finish developed jointly by AKZO Coatings and BMW Technik GmbH. During the Z1s launch, BMW suggested that owners purchase an additional set of body panels and change the color of the car from time to time. The car could actually be driven with all of the panels completely removed, similar to the Pontiac Fiero. BMW noted that the body could be completely replaced in 40 minutes, although Z1 owners have reported that this may be optimistic. The entire vehicle was designed with aerodynamics in mind. Specifically, the entire undertray is completely flat and the muffler and rear valance were designed as integral aerodynamic components to decrease turbulence and rear lift. The front end reportedly induces a high-pressure zone just forward of the front wheels to increase front-wheel traction. The Z1 has a drag coefficient of 0.36 Cd with the top up or 0.43 Cd with it down. The body with its high sills, offers crash protection independent of the doors, the vehicle may be legally and safely driven with the doors up or down, although they are not legal in the U.S. The windows may be operated independently of the doors, although they do retract automatically if the door is lowered. Both the window and door are driven by electric motors through toothed rubber belts and may be moved manually in an emergency. 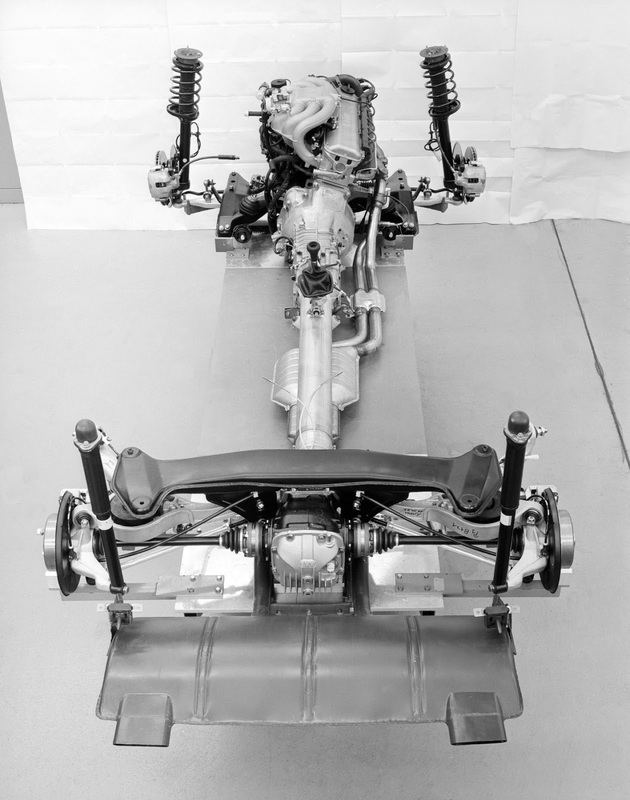 Both the engine (the BMW M20B25) and the five-speed manual gearbox (the Getrag 260/5) were sourced from the E30 325 IX. The 2.5 L (2,494 cc) 12-valve SOHC straight-six engine sits tilted 20 degrees to the right to accommodate the low hoodline. The engine produces 170 hp (127 kW) at 5,800 rpm and 222 Nm (164 lbft) of torque in its original form. Several tuners have programs for increasing the performance of the Z1 by either upgrading or replacing the engine. 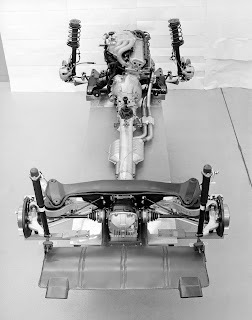 The rear suspension, called the Z Axle, was specially designed for the Z1. It was one of the first BMWs to feature a multi-link design. In the 1990s, the Z-axle would be used on a variety ofBMW Group vehicles, including the E36 BMW 3-Series and the R40 Rover 75. The Z1 was outfitted with 15 in (381 mm) diameter by 7 in (178 mm) wide wheels on both the front and rear, shod with 205/55VR-15 tires. The instruments on the Z1 are styled like motorcycle gauges, and the tachometer on the Z1 has a red needle, whereas all other gauges have a white needle. BMW only produced 8,000 Z1 models. The majority of these (6,443) were sold in BMW's native German market. The country to receive the second-greatest number of Z1s, Italy, received less than 7% of the total sold domestically. BMW was reportedly unable to build more than 10 to 20 Z1 vehicles each day. None were initially sold in North America, although examples have been independently imported since the car's launch. There are reports that BMW built 12 Z1 vehicles during 1986 and 1987, bringing the total to 8,012 vehicles. However, most sources report the 8,000 figure. More than half of all Z1 vehicles (specifically, 4,091) were produced for the 1990 model year. Seventy-eight Z1 vehicles were reportedly used as test mules, although most were later sold without a warranty and, presumably, at a lower price. The Z1 was available in six exterior colours and four interior colours, although the vast majority (6,177) were red, black, or green with a dark grey interior. Light yellow exterior (fun-gelb in German or fun yellow in English; 133 examples made) or red interior (38 examples made) are the rarest Z1 colours. The colours swimming pool blue and oh-so-orange were reserved for the car's designers, Bez and Lagaay. Reportedly, some 1,101 Z1 vehicles were delivered without a factory radio installed. In these vehicles, BMWS AG installed an aftermarket Sony radio in its place. None of the Z1 vehicles were sold with air conditioning. The vehicle's dashboard is very small and there was no room for both heat and cooling units. Some Z1 vehicles were converted using BMW E30 parts to have air conditioning, but reportedly the heater elements had to be removed. 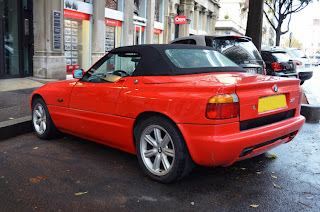 BMW Z1 vehicles officially imported to France for sale there have yellow headlights instead of the clear ones found elsewhere. New Z1 vehicles sold new for 83,000 to 89,000 DM or between €42,000 and €45,500. As of 2001, used BMW Z1 vehicles were selling for between FF125,000 and 250,000 (between €19,000 and €38,000) in France including a 19.6% VAT. One example fetched just over £20,000 at Bonham's 2004 Olympia auction. In 2006, cars could be bought in France for a price between €25,000 and €30,000 the upper being reach for cars in perfect condition with low mileage. German motor tuners Hamann-Motorsport, Schnitzer and Kelleners had programs for the enhancement of the Z1. The Hamann program included a 220 hp (160 kW) 2.7 L or a turbocharged 245 hp (183 kW) 2.5 L engine. Schnitzer did the 2.7 conversion with 200 bhp (150 kW), delivered a five-stud conversion with bigger brakes and lower suspension in combination with their Rennsport wheels. Kelleners' included a 286–330 hp (213–250 kW) 3.0 L engine. Alpina had a special arrangement with BMWS AG to modify BMW Z1 vehicles into the RLE (Roadster Limited Edition). Alpina built 66 of these, although BMW notes that up to 82 Z1 can be tracked through "tuner cars" (most of them delivered to Alpina). About half of the Alpina RLE were delivered to Japan). The RLE featured an upgraded 200 hp 2.7 L engine, sport muffler, new springs (front), 17-inch rims/tires, and assorted (numbered) plaques (at steering wheel, shift knob and wheels) and the typical Alpina-Stripes. The 0–100 km/h (0–62 mph) time dropped from 8.4 seconds to 7.1 seconds, top speed increased from 219 km/h (136 mph) to 228 km/h (142 mph), and price increased to 116,000 DM. The Engine was also offered as an upgrade - and about 7-8 Z1 were upgraded by Alpina in Buchloe to the RLE-Specs (without the 17-inch Wheels and numbered plagues). Manufacturer of the RLE is Alpina, the updated versions still shows BMW as the Manufacturer in the papers with all changes approved by the TÜV in Buchloe. At least one Z1 has been modified with a 330 PS (243 kW; 325 hp) E34 M5 engine. Minichamps, Schabak, Revell, and Herpa have made die-cast and plastic models of the Z1. Additionally, 16,000 phone cards (10,000 in February 1992 and 6,000 in November 1997) featuring pictures of the Z1 were issued in France. The BMW Z1 also had a very small part in the Jackie Chan film, Armour of God II: Operation Condor. Last updated on 2 August 2013 at 11:50.